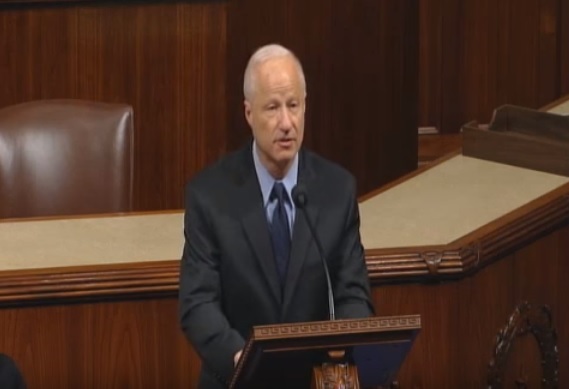 U.S. Representative Mike Coffman (R-CO) urges his colleagues to vote on H.Res. 128 to address human rights abuses in Ethiopia on the House of Representatives floor on 1st November 2017. A United States legislator is again pressing for a vote on House Resolution 128, a measure calling for human rights protections and inclusive governance in Ethiopia that was supposed to be up for a vote last month. It was postponed by what supporters say is suppression by the Ethiopian government. Coffman’s appeal follows a Human Rights Watch letter, signed by other human rights organizations, that was sent last month to U.S. House Speaker Paul Ryan and key elected representatives. Specifically, it condemns the excessive use of force by Ethiopian security forces and the killing of peaceful protesters; the arrest and detention of journalists, students, activists and political leaders, and the Ethiopian government’s abuse of the anti-terrorism proclamation to stifle political and civil dissent. Coffman’s comments came as Ethiopia again denied the release of Oromo leader Bekele Gerba, despite a court ruling Monday that he was to be freed on bond. The U.S. resolution also calls on Ethiopia to admit U.N. human rights observers and includes language to support targeted sanctions against Ethiopians responsible for gross human rights violations. Coffman said that if the Ethiopian government wants to correct any negative perceptions about the country in the U.S., the solution isn’t a public affairs campaign but rather an end to the repression of the Ethiopian people. HR-128…….. It is part of the usual USA’s jock on human rights, ….forget them and think yourself…..!! Don’t forget USA is the best friend of KSA……! !